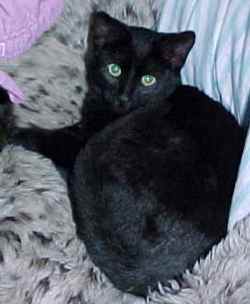 Midnight (formerly Ragu), adopted in November 1999 by Allan, was a feral living near Logan Airport where he got his head stuck in a spaghetti sauce jar. He managed to break the jar but the ring (and sharp glass) stayed around his neck until he was rescued. Midnight has settled into his new home where he has several other cats to keep him company. Allan sent us these pictures and stories: "Scotty (black cat at left), is an alumnus who came to live with us along with Lady Jane and Adele. 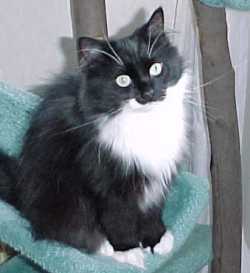 Scotty at time of adoption was labeled a loner. 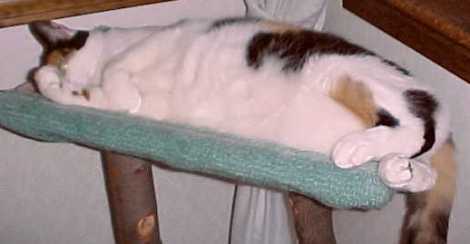 He has since become the 'Puck' of the family, carrying on from anything from 'sink monitor' (loves running water and if you use the bathroom (guests beware) you had better close the door) to official greeter, even having his hammock on the landing above the front door. He loves his new mentor (Daddy, white/black cat above) with whom he can rough house to any degree, much to the occasional chagrin of Adele and Lady Jane who are two of the ladies of the residence. Adele (left) has recently come out of her shell and loves to follow up everyone else's meal to 'help clean out their dishes' should they need assistance. She loves the bathroom rug, so much so that pieces of it keep disappearing only to reappear in other portions of the house, usually clinging to her fur or claws. She loves toys, as does Scotty, especially after two o'clock in the morning. She is very meek until one attempts to comb her (it usually takes two) unless Alpha Cat (me) does the job; then it is a romance. This girl can eat, but she retains her girlish figure. Lady Jane (above) is the Jane of "Pride and Prejudice" by Jane Austin, shy, demure and absolutely horrified at Scotty's loutish play when directed at her. She has become the Lady of the lower regions, having the entire downstairs, including a direct view of bird feeders and any marauding outdoors cat at whom she vociferously howls. She and Daddy (Daddy being senior Cat) hit it off almost immediately; this enabled her to adapt to the multi cat household. Jane loves to be brushed, held and petted, but the petter had better drape a towel over his shoulder because this girl drools in her ecstasy. The three alumnae are aptly photographed based on the descriptions above. 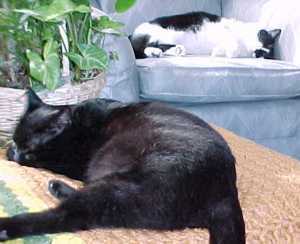 Daddy, as senior cat, and Aurora, the Matron of the house, although not alumnae but rescued in Florida after being abandoned, have received the new folks well, after initial difficulties created by (you guessed it, Scotty); however after Scotty was given his 'young man' talk by Daddy, they have become the mainstay of this home."